The New Castle County RED Team was established in 1992 with 16 members of various New Castle County volunteer fire companies as well as the Wilmington Fire Department. There were no funds dedicated for the teams operation and all equipment purchased were done so by each individual team member. Training and certification levels achieved and maintained were also done by each individual at their own expense. 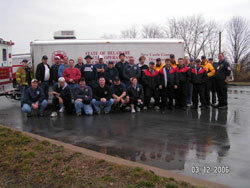 In 1996 the Holloway Terrace Fire Company purchased equipment and sent 6 members for certification through PADI. This gave the fire company 8 total members trained as divers. In 1998 the management aspect of the county RED Team was turned over to the Holloway Terrace Fire Company as the sponsoring fire company. The RED Team still made responses and trained as a team still operating on limited funds and the members who had originally joined the team were still using their personal equipment. In 2000 the team had received a grant from Homeland Security for $127,000 dollars and trained 20 divers and 10 dive tenders as well as all equipment for each member. This started the inception of the New Castle County Dive Team a part of the New Castle County Special Operations Teams. The dive team has continued to receive funding through both Homeland Security and New Castle County government. We have used this money to equip our divers and support staff with state of the art equipment and specialized training. The team’s equipment includes complete dry suits, full face masks, tethered and wireless communications, vehicle recovery systems (air bags), and numerous other items. The members’ training varies from basic scuba diving classes to Dive Master as well as specialized classes through Dive Rescue International. These classes are Public Safety Diver, Current Diving, and Haz Mat Diving. We also have members trained in treatment of Hyperbaric Emergencies. We are still furthering our education with additional specialized classes and will be getting the rest of our team members up to par with the rest of the teams training levels. The newest addition to our team will happen in January 2008. Thanks to monies secured from the Delaware Emergency Management Agency with Homeland Security funds, the dive team has purchased a response vehicle built by EVI Inc. This vehicle will be used for both operations and towing our equipment trailer. The dive team had relied on the use of fire company vehicles to tow our trailer in the past, with this vehicle we will now be self sufficient for a majority of the incidents we respond to and for our training classes.